Rather than starting off with a specific material in mind to achieve a particular visual effect, specifiers should first consider broader issues such as life expectancy, buildability, patina, maintenance, and how much the client is prepared to pay to achieve the desired aesthetic. Only then should you seek advice on the right metals, finishes and sorts of installations that can meet the brief. Generally, hard metals can offer a distinctive appearance and a long lifespan because as well as having a self-protective patina they are low weight and 100% recyclable. Each commonly used roofing and cladding metal however has its particular pros and cons. Zinc, for example, is particularly suitable for marine environments, while stainless steel in the appropriate grade lasts longer. Copper, also excellent in marine environments, looks great but is considerably more expensive. As well as metal choice, the look of a roof or cladding depends on how it is laid and the type of joint used. If an architect wants something crisp and neat they might be drawn to the flat panels of an engineered facade for example, rather than the aesthetic offered by traditional methods. Whether you have a cold or a warm roof structure, the right build-up is essential. One of the biggest issues with zinc roofing is underside corrosion, which can occur if the wrong substrate or build-up has been installed, in particular the vapour control layer. Traditionally, a cold roof build-up with ventilated cavity below the substrate and ventilated eaves and ridge would allow moisture on the underside to be naturally vented out. This is the most common form of roof construction and has kept metal roofs condensation-free for generations. But architects increasingly want to see crisper roof detailing with thinner roof build-ups and so are using warm roof constructions with non-ventilated eaves and ridges. If this isn’t built properly it can lead to condensation. When used with a warm roof structure, zinc must have the right protective back coat for moisture control to protect against corrosion, as well as a breather membrane. Without them, it can corrode in as little as six months. Confusion about the positioning and role of vapour control layer and breather membranes can cause major problems – I have even seen two breather membranes used instead of one of each. But architects can be supported by specialist knowledge: SIG Design & Technology provides an NBS specification, bespoke details and 3D build-up of the installation for the contractor so that everyone knows what is needed. This is a massive issue. There is no British Standard for the installation of zinc roofing, so it is crucial to use the right contractor. We advise architects to specify that their metal roof be installed by an accredited contractor such as a member of our DATAC scheme or a member of the Federation of Traditional Metal Roofing Contractors (FTMRC). SIG D&T offers a UK-issued guarantee of up to 25 years for roofs installed by a DATAC zinc and copper accredited contractor, which is peace of mind for client and design team alike. ZINC: Excellent BREEAM credentials. Zero maintenance with no painting required. Can last up to 60 years if installed correctly with the right build-up. Particularly suitable for marine environments. Generally available with a natural, pre-patinated or pigmented finish, or with roller applied textures. STAINLESS STEEL: Has a longer life expectancy of up to 80 years at a comparable cost to zinc. It is extremely corrosion resistant and requires no maintenance. Various surface treatments are available although some finishes can ripple slightly, which can be a plus or a negative depending on the look desired. but its corrosion resistance and lack of maintenance requirement make it more effective than first appears. Widely available in natural, pre-oxidised or pre-weathered green and in bronze, gold and green tones. STANDING SEAM: Either traditional or with a longitudinal joint. This gives a 90° instead of a 180° fold to give a straighter seam with more uniform joint width. FLAT LOCK OR SHINGLE SYSTEM: Hidden fixing makes this suitable for flat and curved facades. Can accommodate different geometric shapes. Usually used with a vented façade construction. TRANSVERSAL JOINT: Flat lock joint formed by making a 180° fold along each end of the trays to form a 5mm ‘jump’. Not as noticeable as the standing seam. PANEL SYSTEM: Suitable for flat or gently curved facades with hidden, usually direct, fixing and either transversal or longitudinal joint. ENGINEERED FAÇADE: Large format, individually demountable panels suitable for all wall constructions. 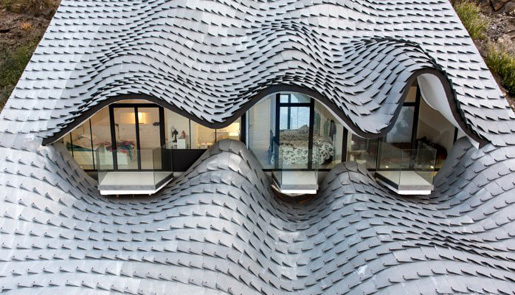 Book our Hard Metals CPD and learn more about specifying hard metal roofing and cladding. You can also subscribe to our blog for free roofing design advice as we publish it. Any questions? Please do ask them below or get in touch with us. The article originally appeared in the RIBA Journal.